6.94 points at 17 votes (rank 361). 1940: Here you meet pursuit planes and at the end a bomber. 1970: Watch out for the homing missiles. 1983: These jets are very manoeuvrable and generous with missiles. 2001: In the last level you fight against flying saucers and a huge ufo. 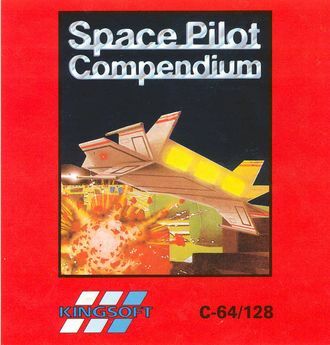 Space-Pilot is a multi-directionally scrolling shooter by Kingsoft from 1984. 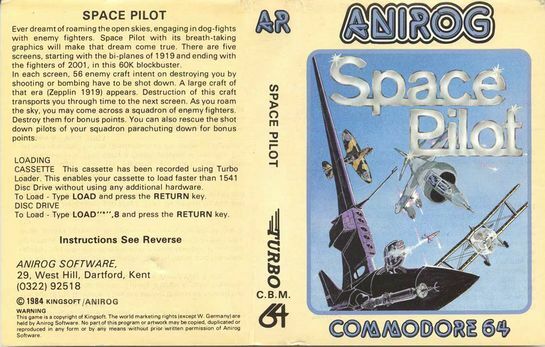 The player steers a figher jet, which has obviously been equipped with a time machine, through 5 time zones, in which he has to defend himself against hostile flying armed forces fitting the corresponding epoch. If 56 hostile machines have been destroyed, a mother ship appears which can be shot with 5 shots, whereupon the time jump to the next era follows. Bonus points can be gained by collecting sky divers and destroying enemies in formation flight. After finishing the fifth and last time zone successfully, the game starts anew. Time zone 1 - 1919: The age of the double deckers. These are slower than the own jet but they defend themselves with bombs. To finish this epoch of WWI you need to shoot a zeppelin. Time zone 2 - 1940: "Spitfires" and "Heinkels" are now the enemies. These fly faster and have a stronger firepower. A bomber can also appear, which needs to be hit 3x to get a bonus of 1.500 points. At the end of this level a "Junker" appears. Time zone 3 - 1970: Here you meet combat helicopters that reach the speed of your own jet and shoot missiles. At the end of the level you need to shoot a Chinook transport helicopter, although the manual talks about a "Gunship" combat helicopter. Time zone 4 - 1984: The age of the fighting jets. They are very fast and agile and have a deadly armoury. This epoch is finished by shooting an oversized prototype. Time zone 5 - 2001: The attack of the flying saucers. In a meteorite field you need to make your way against the attackers and then destroy the mother ship. 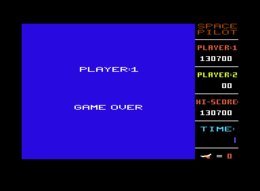 Space-Pilot is a 1:1 copy of the arcade machine "Time Pilot" published by Konami in 1982. The own jet is always in the centre of the game area, which scrolls into all directions by changing the flying direction. White and grey clouds are floating across the sky and can cover both friend and foe, but are otherwise totally harmless. The objects in the game are designed simply, especially the clouds seem blocky. The tendency towards flickering or momentary disappearing of enemies, if there are many of them on the screen at the same time, is highly visible. In such moments there is also a perceptible slowdown of the happening in the game. The scrolling is rather ungentle. The time jump at the end of a level is shown by a stroboscopic effect. 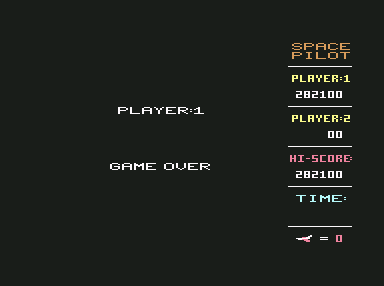 Space-Pilot has no music, the minimalistic sound effect sound thin and tinny. The highscore is not saved. In each level (except for level 5) you can collect up to three sky divers and you get 1000 bonus points for the first, 2000 for the second and 3000 for the third. If you lose a life the bonus is reset to 1000. A signal sounding 3 times indicates that a formation of six machines is about to appear. If you make it to eliminate the complete squadron, you get 2000 bonus points. The double deckers in level 1 can throw bombs that always fall downwards. In level 2 you can shoot brown airplanes to get 1500 bonus points. The homing missiles in level 4 and 5 can be irritated by repeated change manoeuvres. Flying into the same direction for too long mostly ends deadly. The jets and UFOs are sometimes hard on the heels of the own jet and need to be eliminated by a turning manoeuvre, before they get a chance to shoot. The UFOs in level 5 do not shoot homing missiles but therefore very often rotating missiles which can be dangerous due to their size. The version by Nostalgia has trainer options. 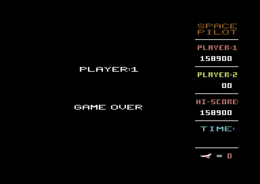 Robotron2084: "A technically not convincing game, which is more fun than one could assume despite its many faults. 5 out of 10 points." H.T.W: "Very good conversion of the arcade machine with controls you must get used to and partially off-key sound. But always worth a game due to the retro factor." Colt: "A conversion which is rather acceptable for 1984 and despite the slowdowns and other small defects can be played rather well." TheRyk: "I know really worse shooters that were released much later and cannot hide behind their age. In my opinion Space Pilot deserves a nostalgia bonus despite the flaws and passes for me as a rather good shooter, 6 points." Equinoxe: "I found the game simply great at that time and spent the one or other hour with it. If you get the hang of the unusual controls, the difficulty grade is unfortunately not really high any more. However, 6 points from me." 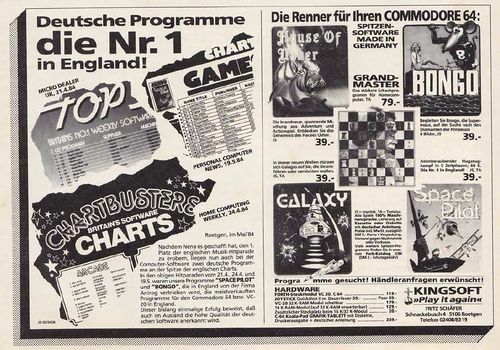 Space-Pilot was one of the first games from Germany that made it to reach a high rank in the hit lists of several English-speaking computer game magazines. 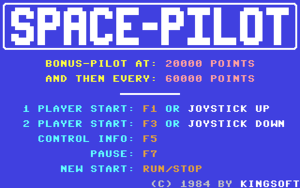 There is a version of the arcade machine "Time Pilot" with a modified chip set (so-called bootleg version) with the title "Space Pilot". Cover of the version by Anirog. 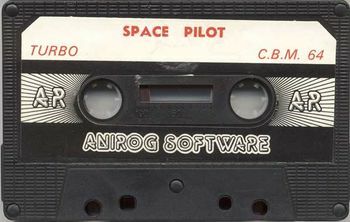 Cover of the Space-Pilot compilation, which also contained the follower Space-Pilot II. 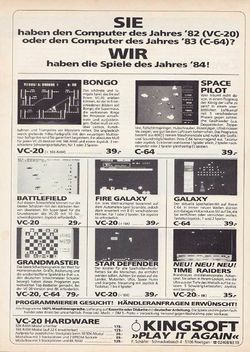 Space-Pilot in a German advertisement by Kingsoft. Space-Pilot in an advertisement by Anirog. 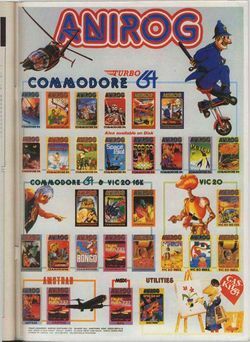 Time Pilot in the Killer List Of Videogames.